'Couch Hopping' presents an International Club Night. 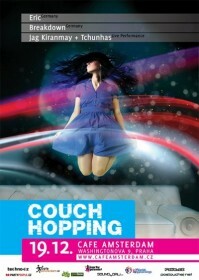 Couch Hopping originated in Germany and will strive to bring what's best in electronic music. Please join us and be part of this special event. You can look forward to two very special guests from Germany, Eric and Breakdown who will be accompanied by live 'Traktor + Ableton' performance by dj duo Jag Kiranmay and Tchunhas.